We wish you a healthy and happy New Year! Shoulder injuries used to be life-changing. Now, we can fix them. If an alien landed and walked up to you, what would the alien think you are? Certainly not human. That’s because of the 10 trillion cells that make up your body, only 1 trillion are human cells, while 9 trillion are microbes — and not just bacteria, viruses and fungi. A twisted ankle is a common injury, but thankfully it is usually minor and can heal without surgery. What you want to avoid is having it twist repeatedly afterward. 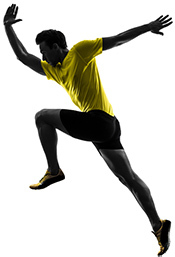 Over the past 13 years we have optimized the program we call StoneFit for orthopedic rehabilitation. For each injury, we custom-design a set of exercises to work around the injured joint using the principles of combined functional exercises. Many people have “smart phones” these days, which allow you to jot down notes to yourself. Create a note called “Health,” and list when you have annual physical, teeth cleaning and any surgeries. While elite cyclists, with prize money and international rankings at stake, get straight back onto their bikes with broken clavicles, the rest of us tend to be more sensible in our approach to healing. Can't find the right words to describe the symptoms of your health concerns? Not sure when they began? Don't worry, data captured from your body will soon be revealing all, perhaps picking up problems before you're even aware of them. It ain’t over when it’s over! For all marathoners out there, it is time to address a subject that is often overlooked – what to do when it’s over.